A year after its release on PC, the action-RPG from Warner and Arrowhead gets a new edition for PlayStation 4. 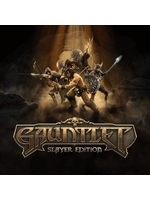 Gauntlet: Slayer Edition is now available for $19.99 and features "daily Colosseum challenges, loadout options, relic and potion functionality, weapon abilities and customisation". There's a typo in title, "Gautlet"